I remained calm. This type of thing had happened to me many times before. Things do tend to go wrong when you cycle long distances, particularly when, like me, you don’t do your research. But I knew not to panic and within a matter of seconds I’d processed the information and come up with a new plan. “Oh yes, I’m quite sure about that,” I said, without having looked it up. We got off the ferry and started cycling around the lake, our plans still up in the air but now being at least vaguely to head east for Austria. Another cyclist, a local man out for a ride, pulled alongside me and asked where we were going. I explained that I didn’t really know. We were trying to get to Italy, but we’d just found out we were going to have to go via Austria. The man, Hubert, wanted to help further, so he suggested that we all stop together in the next town and he would help us to make our plan. As if this wasn’t already nice enough of him, he also insisted on sitting us down in a restaurant and buying us lunch. It was another act of generosity and kindness from a complete stranger – following on from Ludo and Alda’s hospitality in Belgium, and Hardy’s pizza delivery in Germany – that was already becoming a running theme of our trip. As we tucked into our pasta sitting outside with a stunning view of the lake and the mountains, it was time to get down to the serious business of planning our route. Once Hubert had been thoroughly convinced that there was no way on earth I was going to be getting on a train for three kilometres, a detour to Austria was our only option. The relatively easy 1300 metre Brenner Pass was indeed open, according to the internet on Hubert’s phone, but to get there we would have to first go over the 1800 metre Arlberg Pass. Another blow to our chances. Now we would have to make a massive detour north back into Germany in order to circle around to the Brenner Pass. Would we have time to do all that before Dea’s flight? A lucky break at last, and our route was decided. We would ride over the Arlberg Pass and then the Brenner Pass. But now a gentleman at the next table was entering the conversation. He was a kind-faced motorcyclist who’d overheard us talking, and he suggested that instead of taking the Brenner Pass, we could turn south a little earlier and take the Reschen Pass. It went a little higher, at 1500 metres, but was a lot quieter and more bicycle-friendly. And, finally, we had our new plan. Hubert wasn’t done with being nice, though, so he cycled with us for a few more kilometres, and pointed us the way ahead. We thanked him for all of his help as we waved him goodbye, amazed again by the incredible kindness of strangers. The way ahead for us took us up and over a 500 metre pass, a little warm-up for the challenges that lay ahead, that certainly did warm us up. The descent brought us down to a cycle route that was familiar to me. I’d ridden it in the opposite direction back in 2013, when I’d been going from Austria/Liechtenstein to Zurich to meet the legendary Dr Dave. On that particular day it had been raining, and Lake Walensee had looked miserable and grey. Now, in the bright sunshine, it looked like a completely different place. The water was turquoise like the bay of a Caribbean island, and the mountains on the other side glowed in the sunlight. It was a fantastic ride along the shore of that lake. Before we knew it we were back beside the Rhine river again, such a long way from where we had first encountered it in Cologne. We crossed a bridge and found ourselves in Liechtenstein. For me it was the third time I’d cycled in this tiny country, and it felt good to be back as we rode together on a flat path beside the river with views of Alpine mountains. In my book I’d described cycling here in 2013 as some of the best cycling, and I’d written that I’d felt like there was nowhere I’d rather be, and nothing I’d rather be doing. In 2017 I looked around me now at the mountains and the river, and particularly at Dea, cycling alongside me and smiling, and I realised that it was still true, now more than ever. There was nothing I’d rather be doing, and no one I’d rather be doing it with. And there was no one I’d rather have by my side than Chris on my first mountain crossing. Despite the lack of research of the Gotthard pass (which was not entirely Chris’s responsibility) that had now tightened our schedule to make it to Bologna and was going to take us over two passes instead of one, I trusted this man entirely to be my partner in the quest. He told me about what we could expect from the mountain climbs, and we made a plan to spend three days climbing the two passes. But it was not so much about knowing every little detail beforehand and having everything under control, but about being able to deal with the unexpected events that came upon us in any given moment. I believed that was a strength rather than a flaw, and I loved that it was our way of travelling. 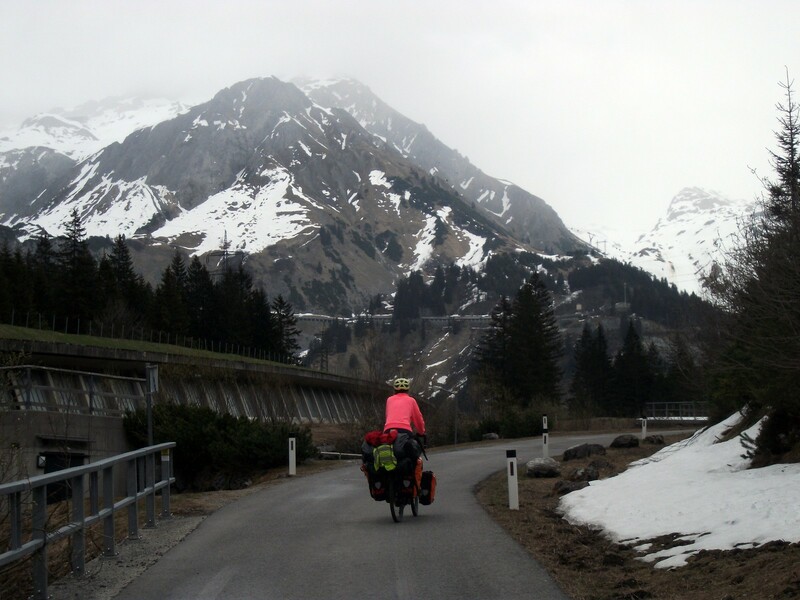 As we cycled out the first Austrian town, Feldkirch, we now saw more snow-capped giants in the distance, and this time we knew they were our mountains, they were the ones we were going to engage in a humble battle with for the next few days. We camped next to the river that we would follow up over the first pass. It was wide and strong, but I was about to learn its story following it up to where it was only just a child. The first mountain day began with 20 kilometres of flat along the river. With anticipation I eyed the mountains ahead, wondering when it would really begin. And when it began I was pleased to find that the quiet roads and paths we followed via the Claudia Augusta route ascended gently so that we steadily went up through the valleys away from the main road traffic. We passed through little villages that bore indications of the skiing activities that took place here in winter with ski lifts, maps of the slopes and guest houses. We even saw some people walking awkwardly around in the snowless village in their skiing clothes and boots looking like they had turned up too late for the show. Chris and I put on another show when we found the first little spot of snow on the ground, and it was a show of a snowball fight that ended when I hit Chris right in the face with my first throw. But he was right. The real climbing began now and slowly we climbed up, still being led on smaller roads away from the traffic. Then we saw a wall of a mountain rising before us with the road fighting its way up in several switchbacks. All went still inside me. This looked a bit intimidating, especially as we would have to go on the main road now. Fortunately it was time for a break first, and we sat down facing the climb ahead of us building up our mentality by stuffing ourselves with chocolate and cookies. Then a man came over to talk. His name was Helmut and he lived in the nearby village. He’d cycled the same way as we were about to via the cycle route to Italy and he told us it was only 7 kilometres to the top and that the Reschen pass should be very easy. He was very interested in people doing adventures and asked us if we would send him a postcard when we had made it to China, so I carefully wrote down his address and kept it safely, hoping we would really make it there to send him a greeting. For Christmas probably. Helmut left, but appeared again 15 minutes later with three bars of chocolate for us. Yet another act of genuine care and generosity, and with that I was perfectly ready to deal with that mountain. Very unexpectedly it was almost a rush to cycle up the switchbacks. The road was busy, but also wide and the cars drove slow and gave us space. I was amazed by the road structure again and again stopping to look back down at it curling underneath itself as if it was doing a cat walk. At the top we got covered in the grey, wet clouds that had been hanging over the mountain tops all day and we could not see more than 50 metres ahead. Of course it was a shame we didn’t have the great views of the pass, but I appreciated how wild and rough it felt, especially when the rain turned into snow. A few days earlier we had been cycling along green valleys and fresh rivers in shorts and t-shirt with no worries in the world, now we were battling a snowy mountain pass – and we were almost at the top of it. I felt alive. We stopped to eat some of Helmut’s chocolate, it was freezing cold and wet and we could not stand still very long before we got cold, so we continued and soon after some buildings appeared. It was a restaurant and guest house and on the front it said: Arlberg 1800m. A wave of excited happiness rushed through me and brought a big smile on my face. I’d climbed my first mountain, now I knew what it was like, now I knew I could do it. And it was exactly 7 p.m. I was impressed, again, by Dea and how well she’d handled the climb (though it had not come as a surprise to me). Now we had to concentrate on getting down before dark. This required a quick change of brake pads for me as mine were too worn for the long descent on the steep, wet road. With all our brakes aligned and wearing all of our clothes we began the long downhill. It was an exhilarating rush to be flying along so fast again, and within moments we were back below the snowline and heading rapidly for more green valleys. After finding a nice spot to camp, the next day we took things nice and easy. It was far enough to the start of the Reschen Pass that it made no real sense to try and rush there, especially as we were both a bit tired from the Arlberg Pass. So we eased our way down the mountain to Landeck, where we turned south, joined the Via Claudia Augusta and started to follow a different river that would lead us eventually to the pass. We took our time, stopping for a game of beach volleyball, then to charge our laptops. We then camped in a grassy field with a view of the snowy peaks ahead of us. Refreshed, we continued following the bike route the next day, and I was impressed by how far it continued up the pass. Almost the whole way up we had our own segregated bicycle path and it was a pleasure to ride on. Only when we got to the business end of the climb, the final steeper section, were we forced onto the road. Unfortunately there was some confusion about which road to take, with one climbing to the left, and another, the one we were on, forking right. When we arrived at a signpost welcoming us to Switzerland I realised that we were probably on the wrong one, and we turned around and retreated back down the hill. After a couple of kilometres we reached the path again, where there was a sign that we’d not noticed, telling us that we weren’t allowed to cycle on the main road in Austria, and that we’d been going the right way after all. We turned around and climbed again. It turned out that we had to go briefly back into Switzerland, then take another road over the top of a mountain into Austria. The road climbed in a series of steep switchbacks, but it was really quite alright. Conquering the Arlberg Pass had given us both the confidence that we could do this one too, and with the weather being better it was a nice climb, and a very nice feeling to reach the top. This was it, we’d made it – the Alps had been climbed. I see that your route afterwards takes you down through Africa and then across South America. I will just have finished the Africa portion of your journey in the reverse direction by the time you start on it, so if you have any questions at all feel free to fire me an email or leave a message on my guestbook on CGOAB. Also, if you have any questions on the South American leg feel free to fire them my way too. All the best to the two of you on your epic journey! Good to hear from you again. We are by chance staying in an apartment in Bosnia along with Jacob, who you cycled with in Brazil. We’ll probably cycle together a bit, though he is apparently twice as fast as us, so we’ll see, but I’m probably not up for cycling 160 km per day to get to any barbecues!